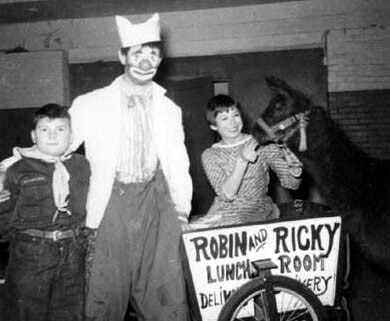 Tip-Top Fun with Irv Romig as Ricky the Clown first aired in October of 1953. By 1956, WXYZ’s programming director Pete Strand was looking for a new format for Channel 7’s favorite circus clown. Strand saw actress Lally Deene in a local stage production, liked her perky persona, and thought she would be the perfect foil for Ricky’s raucous antics. Deene, a U.S.O. performer during World War II, appeared on Broadway in Dear Ruth, and went on tour with I Am A Camera, Dark of the Moon, and Winslow Boy. She moved to the Detroit area when her husband John C. Thiele received an offer to direct industrial films for Jam Handy Studios. The Robin and Ricky Show aired live every Monday thru Friday at 11:30 A.M., right before Lunch With Soupy. Deene played Robin, the waitress of WXYZ’s lunch counter. Romig was still Ricky the Clown, but his trademark yellow and black derby and red plaid suit were traded for a busboy’s uniform. Bambino the live donkey rounded out the cast. It was a bizarre premise, but somehow it worked. The show was a hodgepodge of jokes, skits, music, magic tricks, stories, birthday wishes and Little Rascals shorts. Ronald David, one of the show’s directors, recalls that Bambino the donkey created some special problems. It seems that Bambino would occasionally become “aroused” while on camera. Robin and Ricky was shot with a two-camera setup. The set was extremely small; basically a lunch counter with three stools, and Bambino’s pen in the corner. The small confines of the set made it extremely difficult to maneuver the huge video cameras of the day. On more than one occasion Motor City kiddies tuned in to see Bambino the donkey sporting an erection long enough to scrape the floor. Most of the show’s commercials were done live. On one occasion it was discovered that someone on the crew had raided the prop box, and helped himself to the loaf of Tip-Top bread. With two minutes to go until commercial time, Romig rushed to the corner grocery store for another loaf in full clown makeup. The Little Rascals ran a little longer that day. In 1958 the Robin and Ricky Show was no more, when Deene decided to leave Detroit and try her luck in Hollywood. She did appear in at least one movie, a bit part in a 1984 made for TV film starring Ed Asner. Programming director Pete Strand decided to return the show to its former circus format, with Romig as its sole star. Romig continued working at the station until 1965. Lally Deene died in 1988 of kidney failure at the age of 67.